Nigerian tailors are at it again and this time around it is a beautiful high low dress that was redesigned completely for the client who ordered the dress. There have been many stories of what I ordered versus what I got, and all the time the story does not end well, because the vendor, fashion designer or the service provider always does something that is completely different from what was requested for. 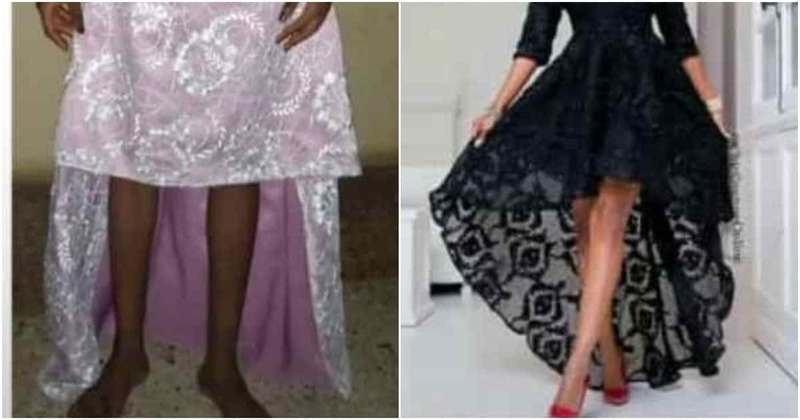 Photos of high low dress a lady ordered compared with what she got from her fashion designer are currently trending on social media. In the photos, it could be seen that the fashion designer did something entirely different from what the lady ordered. The dress she ordered was flared while the one she got is just straight. After photos of the dress compared to what the lady ordered were shared on social media, Twitter, users gave the lady some hilarious advise. Some of them asked her to cross her leg like the lady in the other photo. Some users tried to console the lady by telling her that the tailor was able to get some things in the design she was given. They said the fashion designer got the long back of the dress. The fashion designers who saw the tweet used the opportunity to advertise their market to Twitter users. They showed off what they sewed versus what a client ordered. Others expressed that it is possible that the lady asked for something expensive when she only had money for something less pricey. However, some faulted the client for giving a complicated style to a tailor instead of a fashion designer. In a related news, Legit.ng had reported that a young lady had also cried out after she got something totally different from what she ordered. The lady had bought and when it was delivered, she received something that looked to be worn out and old.